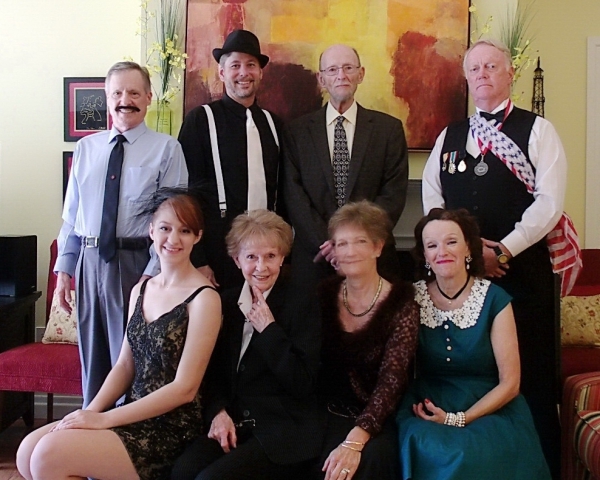 A Mystery Dinner Party consists of eight players, four female characters and four male characters. One couple hosts the dinner/game, prepares a menu, and distributes courses to the other three attending guest couples. Each game is a costumed event and takes place around the dinner table. Participation is one mystery dinner game per calendar year. Each person/couple is obligated to host but must have played already one game. The host couple will determine character assignments, date, and time for the party plus a summary of the game and costume suggestions. On the day of the party, the host proceeds according to a schedule that includes a cocktail hour, seating at the table and a brief discussion of game procedure and distribution of player manuals. There are four rounds of play involving discussion prompted by each player’s character manual and each round is followed by a dinner course. In general, all of the parties for a given year will play the same game so secrecy as to characters, methods, and results is required.